Professor Ron Barrett’s “Anthropology of Death and Dying” class took action on prevention of suicide. Anthropology professor Scott Legge and Science Museum archaeology curator Ed Fleming led a summer archaeology field school experience for students of the University of Minnesota and Macalester College, including Anastasia (Heidi) Bjornlie ’18, Grace Brickner ’20, Jiwen Fan ’21, and Abby Thomsen ’20. Primary excavations took place at Macalester’s Ordway Field Station along the shores of the Mississippi River in the southeast metro, a great place to look for evidence that helps tell the story of Minnesota’s rich Native past. The site’s location meant it was abundant in plant and animal resources and in close proximity to a river for travel, making it a good place for populations of the distant past to settle. Students learned how to conduct an archaeological survey, with careful, systematic excavation practices, and mapping and documenting finds. As they explored, they uncovered stone tools and pottery fragments and identified two new sites for future excavations. Abby Thomsen served as Research Assistant in the field and continued working with the artifacts at the Science Museum lab to preserve, study, compare, and share with other researchers to paint a picture of Minnesota’s past. 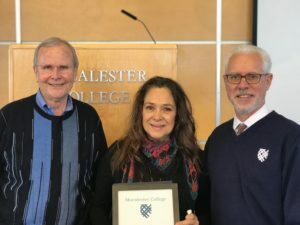 Professor Olga Gonzalez (center) received Macalester’s 2018 Jack and Marty Rossmann Excellence in Teaching Award, presented by President Brian Rosenberg (right) and Professor Emeritus Jack Rossmann (left). This award it given each year to a faculty member who has been identified by colleagues and students as exemplifying the teaching goals of the college. The award comes with a $1,000 cash prize and is announced at the annual Faculty and Staff Spring Luncheon. Lucia Alexandrin ’17 of Gorham, Maine, has won the 2017 Mikiso Hane Prize for Best Undergraduate Paper for her senior capstone paper, “Self, Soul Loss and Motorbikes in Modern Bali.” The prize was awarded by the Midwest Conference on Asian Affairs (MCAA). This is the third time an Anthropology major has won one of the two undergrad prizes awarded by the MCAA in the last six years. Alexandrin also won the Jack Weatherford prize for best capstone. Caroline Vellenga-Buban ‘17, from Monmouth, Ill., has been awarded the 2017 Sylvia Forman Prize for the best undergraduate paper in feminist anthropology. 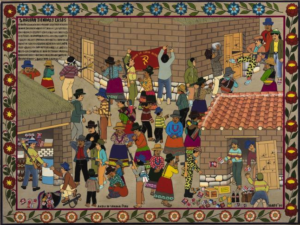 The Association for Feminist Anthropology, a section of the American Anthropological Association, awards the prize each year. Vellenga-Buban’s paper, titled “Queer and Mainstream? LGBT Parents and American Family Values,” was praised by the prize committee for the ethnographic and theoretical quality of the paper. 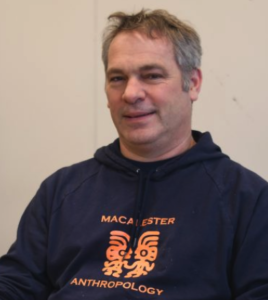 Since 2003, Vellenga-Buban is the fourth student from Macalester’s Anthropology department to receive the Sylvia Forman prize. Professor Scott Legge, Risa Luther ‘16, Cecilia Mayer ‘16, and Katherine Meier ‘16 presented posters at the 85th Annual Meeting for the American Association of Physical Anthropologists in Atlanta, Georgia. Risa, Cecilia, and Katherine also presented at the 6th annual Committee on Diversity Undergraduate Research Symposium. Scott, Risa, and Cecilia presented their research on healed skeletal trauma in Old World and New World monkeys, and Katherine presented on her research in Madagascar on habituation of blue-eyed black lemurs. They presented with over 2,000 physical anthropologists from all over the world. Professor Arjun Guneratne of the Anthropology Department, Andrea Grimaldi ’16, and Sarah Rasmussen ’14 attended the recently concluded Himalayan Studies Conference IV at the University of Texas-Austin, where they presented papers on their research in Nepal. Sarah is a former Fulbright fellow in Nepal and Andrea is completing an honor’s thesis on the impact of labor migration from Nepal on the communities that are left behind.